Growing up one of my favorite meals was Salisbury Steak w/Mashed Potatoes & Peas, at the mere thought of it I start drooling (like I am right now). Until now I haven't even thought to transform this into a vegan recipe, but the other day I bought three vegan cookbooks for my iPod (I use the kindle app), one of them being The Happy Herbivore. This book is full of yummy, healthy, low-fat vegan recipes that I am excited to try out. One of the recipes is for a Mushroom Burger, which immediately made me think of Salisbury steak smothered in gravy (drooling again!!). 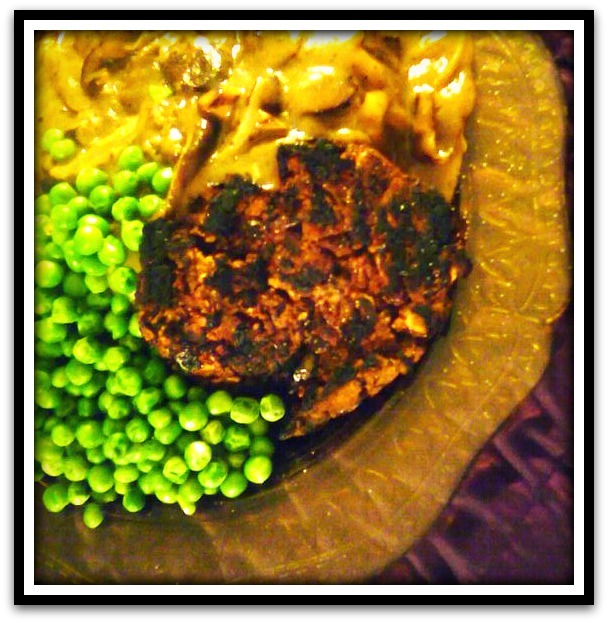 So now is the time to creatively transform this delicious omni recipe into an amazing vegan recipe. Preheat oven to 450F. Grease or line a baking sheet with parchment paper. Place bread slice in a food processor and allow the motor to run until breadcrumbs form. Transfer to a mixing bowl. Place whole mushrooms in the food processor and pulse until coarsely shredded to the size of sliced olives. Transfer to a mixing bowl. Repeat with beans. Combine all ingredients. Using your hands, form 7 patties. Place patties on cookie sheet, spray with cooking spray, and bake for 10 minutes. Flip, re-spray and bake another 8 minutes. Flip, re-spray for a third time, and bake 5 minutes more. Burgers can also be pan-fried or grilled. In a large sprayed skilled saute onions and mushrooms, seasoning with salt and pepper. Cook until mushrooms release juices and onions are almost translucent. In a bowl whisk together broth and flour, until blended. Pour into skillet with mushrooms and onions and cook until thickens into gravy, stirring often to avoid scorching. Serve over mashed potatoes and Mushroom Burger. This dish is GREAT with fresh or frozen green peas. kosher salt, Maldon sea salt or other artisan flaked sea salt. Preheat oven to 425F. Spray cauliflower florets with cooking spray and sprinkle with sea salt. Spread cauliflower in an even layer on a cast iron pan or a cookie sheet. Roast 10 minutes. Turn cauliflower over and re-spray. Roast another 10-15 minutes, or until cauliflower is just browned and fork tender. Season with more salt if desired. 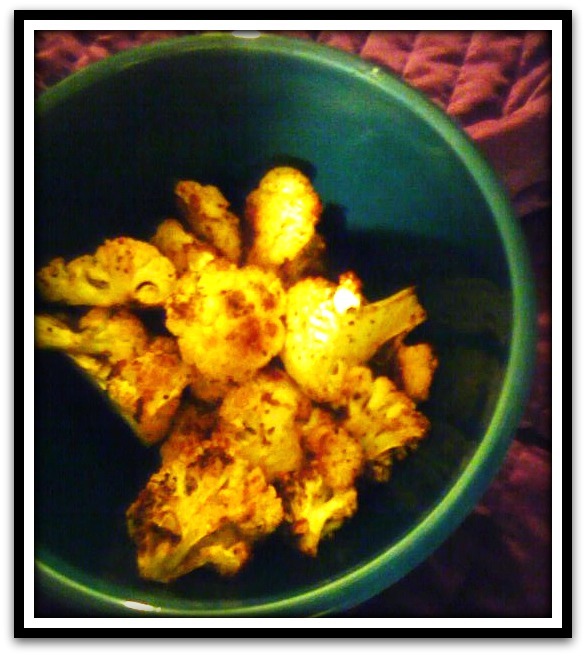 P.S...I didn't want to leave you wondering what health benefits cauliflower has to offer, so here is the link... http://whfoods.org/genpage.php?tname=foodspice&dbid=13 ...and now you know!! P.P.S....Now that I've made the dish, I'm gonna have to say the Mushroom Burgers were good but probably better for a BBQ. The Vegan Mushroom Gravy was AMAZING, and when poured over the mashed potatoes and mixed with the peas it was probably the best gravy I've ever had. I could just eat the mashed potatoes and gravy (with peas) and be completely satisfied. Everything was really good and super flavorful, I would just eat them separately next time! Until next week!! I have to say this looks all yummy. I am actually rather curious about the mushroom gravy. Have you ever tried mashed Cauliflower? I heard its a great substitute for mashed potatoes.... Just haven't had the time to try it myself. I tried it when I was on one of my many low-carb diets....I could tell it was cauliflower! Which I really like cauliflower, but it's not mashed potatoes! of living mean that many people are finding their budget stretched more than in the past. to ask the sales clerk. The first things you'll want to pay each month before anything else are the necessities--food, housing and utilities. There are numerous expenses that can't be neglected when you are running short of cash. Then you will have to wait until the cash advance loan company verifies all the information that you faxed to them. Such kind of financial complexities often disturb the life of some people at the old age.